In June 2018, The Hancock Promise opened its program to high school graduates in the Allan Hancock Joint Community College District. This district spans high schools from Lompoc to Santa Ynez, Cuyama and the Santa Maria Valley. Students from these high schools who immediately enroll at Allan Hancock College are eligible for free tuition and fees for one academic year, a savings of about $1,200 per student. Additional services include priority registration, free tutoring, and other academic support. 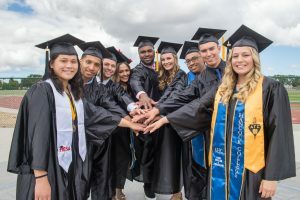 Although not the first community college to start a promise program, The Hancock Promise is the first program to focus on early outreach to elementary and junior high schools, promoting a college-going culture among students and their families. In its outreach, the program holds events to showcase the campus, its programs, and promote student success, familiarizing students and families with the college. Already, there has been growth in first-time enrollments. Projections for fall 2018 show a 113% increase in first-time student enrollment over fall 2017. Allan Hancock’s Office of Institution Effectiveness also reported a rise of nearly 650 first-time students admitted to the college as of mid-July 2018. Students in the Lompoc area have shown the most interest in the program, where the headcount has increased by 53%, while there is a 39% jump among Santa Maria Valley students. To fund this endeavor, the promise program launched a five-year, $10 million campaign in December 2017. The Santa Barbara Foundation kicked off the campaign with a $250,000 investment. Rabobank pledged a gift of $1 million in early 2018. Support has also come from local organizations like the Rotary Club of Santa Ynez Valley and Santa Maria Kiwanis 4 Kids Foundation. To date the Hancock Promise has received gifts and pledges to an endowment totaling more than $3.2 million. To learn more about The Hancock Promise and the impact it is making across Santa Barbara County, please visit hancockcollege.edu/promise.